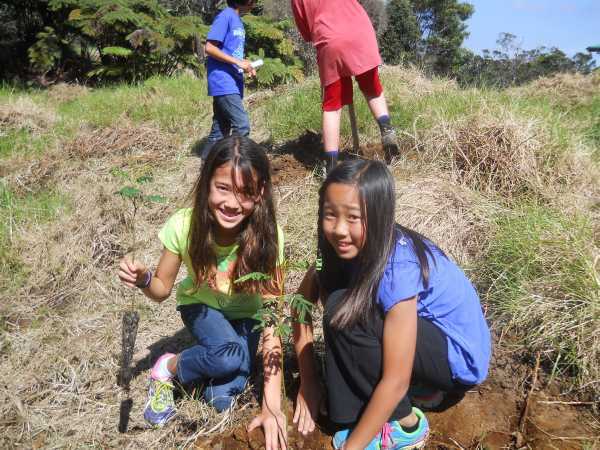 The Keauhou Bird Conservation Center (KBCC) Discovery Forest is a native forest restoration and education project. Critically endangered Hawaiian birds are bred in captivity at KBCC, for release in the wild. The Discovery Forest project includes restoring four acres of native forest per year by clearing invasive weeds, preparing the site for planting, and engaging community volunteers in planting 435 trees per acre. DLNR Division of Forestry & Wildlife (DOFAW) Forest Stewardship Committee recently approved the KBCC Discovery Forest 10-year Management Plan, which calls for restoring four acres per year over the next 10 years. Provide forest materials (fruits, browse, perching limbs) for captive birds at KBCC. Hawaii’s native bird populations are threatened not only by predation, lack of food, but also by habitat loss. Rich forests have slowly disappeared over time, leaving once thriving populations of native birds like the ‘Alala, Palila, Puaiohi, and Kiwikiu on the verge of extinction. In response, the Keauhou Bird Conservation Center (KBCC) was created at 4,000 ft above sea level on former cattle land owned by Kamehameha Schools and leased through a partnership with San Diego Zoo Global. The KBCC is part of the Hawai‘i Endangered Bird Conservation Program, a partnership among San Diego Zoo Global’s Institute for Conservation Research, U.S. Fish & Wildlife Service, and State of Hawai‘i Division of Forestry and Wildlife. The Hawai‘i Endangered Bird Conservation Program uses captive propagation and release techniques to reestablish self-sustaining populations of critically endangered Hawaiian birds in the wild on both Maui and Hawai‘i Island. The mission of the Hawai‘i Endangered Bird Conservation Program is to prevent the extinction and promote the recovery of endangered Hawaiian birds. The program started in 1993, and the Keauhou Bird Conservation Center opened in 1996. KBCC currently breeds four species of birds in captivity, for the purposes of releasing birds to restore wild populations, and ultimately to restore the land. In 2014, HFI worked with KBCC to create the first 1.8-acres of the Discovery Forest. Students from Hawai‘i schools, as well as other community volunteers, planted 856 native Acacia koa and Māmane seedlings. Activities for 2015 include clearing four additional acres and engaging volunteers in planting 2,500 seedlings. Volunteer events are coordinated by Outreach Coordinator Iwikau‘ikaua (Iwi) Joaquin. Iwi inspires youth to connect with their environment by facilitating service learning activities, which connect science with culture. In addition to community volunteers, 1,500 school students visit KBCC and learn from Iwi each year. The KBCC Discovery Forest Forest Stewardship Plan, recently produced by Forest Solutions Inc., calls for the restoration of 40 acres over 10 years. Our goal for 2015 is to clear four additional acres of land and engage community volunteers in planting 2, 500 native seedlings. The KBCC Discovery Forest site was once grazed by cattle and is now mostly covered in non-native kikuyu grass; therefore there is a critical need to restore the site and add to the existing native species, which are found in low densities. The primary canopy species are native trees Acacia koa and ‘Ōhi‘a lehua. These trees, along with other native trees will provide shelter and perching limbs for endemic bird species. Invasive species being controlled include Blackberry, Himalayan raspberry, Banana poka, Firethorn, Kahili ginger, Fire tree, and Strawberry guava. Koa is important from a conservation perspective because it provides habitat for native plants and animals. On the Island of Hawai‘i, 10 endemic, extant forest bird species are currently found in forests where koa is a dominant or associated species. In addition to fixing nitrogen, koa provides watershed protection and is a very important part of Hawaiian culture. Birds forage on insects and their larvae in and around the trees, use tree cavities for nesting, and feed on the fruits from trees which grow in the understory. Wild bird species such as ‘Akiapōlā‘au are koa specialists and require large, old-growth koa trees for foraging on insect larvae. ‘Akepa use koa for foraging and nesting in cavities and ‘Ōma‘o also nest in koa tree cavities. Critically endangered Hawaiian birds in captivity at KBCC include ‘Alalā, Puaiohi, Palila, and Kiwikiu. These birds will eat many of the native understory fruiting species that will be planted in the Discovery Forest. These understory fruiting species will include Hō‘awa, Kōlea, Maile, Māmaki, Māmane, ‘Ōhelo, ‘Ōlapa, Pilo, and ‘Ie‘ie. The ‘Alalā, the Hawaiian crow which are extinct in the wild, will eat fruit from all of these species, except Māmane. Puaiohi will eat fruit from all of these species, except Hō‘awa, Māmane, and ‘Ie‘ie. Palila will eat only Māmane seeds. Kiwikiu will eat fruit from Kōlea, ‘Ōhelo, ‘Ōlapa, and Pilo. 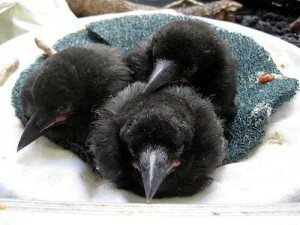 A trio of Alala chicks at KBCC. Photo-San Diego Zoo Global. ‘Alalā are very intelligent birds and are susceptible to imprinting. Animal care staff at KBCC uses puppets to hand-rear and feed the birds when they are young to keep them from imprinting onto humans, so they will behave naturally as adults. The center’s nine-member staff literally lends a hand to save these newborn chicks and the endangered species from sliding to extinction. ‘Alalā are extinct in the wild, and the last were recorded in 2002 in their forest natural habitat, where they were threatened by habitat destruction, introduced predators and avian disease. The entire remaining population is managed in captivity through a collaborative effort by the Hawai‘i Endangered Bird Conservation Program, under the leadership of Bryce Masuda, Conservation Program Manager. Since the program began, its focus has been on pulling eggs for artificial incubation and hand-raising chicks as a means of maximizing the reproductive success of the small population. Temperature and humidity are key physical parameters for egg incubation leading to successful hatching. If the eggs are left in the parents’ nest, the adult ‘Alalā may step on them, kick them out or not incubate them very well. Pulling the eggs and placing them in incubation enables the center staff to closely monitor conditions and maintain a perfect climate to allow the best chances for the eggs to hatch. It also gives the female an opportunity to lay more eggs. The hatching process can be very nerve-wracking for staff because it can take an ‘Alalā chick more than 24 hours to come out of its egg. Staff members sometimes assist with hatching for problematic eggs by peeling back the eggshell piece by piece and pause to allow for landmarks. Once the chicks hatch, they are hand-reared until they are old enough to feed themselves — typically 60 days. Every two hours, eight times a day, the chicks are fed a regular and precise diet of fruit, honeybee larvae and cricket guts. Later on, scrambled eggs are added in the mix. KBCC has recently allowed natural incubation and parent-rearing for select ‘Alalā pairs. Mothers have successfully fed and cared for some of their chicks. Typically 9-12 chicks are born each year. The center has brought the population from a low of only 20 birds in 1994 to over 120 in 2015. Planning and preparation efforts are underway to restore ‘Alalā into its niche within the forest ecosystem on Hawai‘i Island. While it is unknown exactly when the reintroduction will occur, KBCC anticipates releasing 15 ‘Alalā a year in a pristine forest that is plentiful with fruiting plants. Before this can happen, considerations must be made with partners and the habitat must be safe and free of obstacles that caused their decline in the first place. This means a multifaceted approach to conservation, which includes habitat restoration and mitigation of threats to wild populations. Bringing species back from the brink of extinction is the goal of San Diego Global, a nonprofit with extensive expertise in animal care and conservation science. To help the ‘Alalā, KBCC and HFI are providing public education to help these birds and spread the word about this keystone species of the Hawaiian forest. Endemic to Hawai‘i Island, the ‘Alalā help disperse native seeds in the ecosystem and holds special importance to Native Hawaiians who consider it an aumakua, or a family guardian spirit. Education and awareness does not only garner more appreciation about the ‘Alalā and other endangered Hawaiian birds, it helps as they return to the wild.